I recently got back from a trip to Texas, where I spoke at two churches and at a fiction writers’ conference. I enjoyed speaking in Plano at First Baptist Prestonwood, a mega-church that is Bible-based and Jesus-centered. I thank God for Jack Graham and the other pastors and staff. 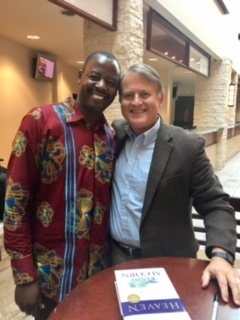 In this picture taken there, I’m with Pastor Johnson Bakashaba, who has a ministry in Uganda, and who was excited to read Heaven. This was my first time at Church at the Cross in Grapevine, with my friend JR Vassar. I love that church, another body of believers bringing Jesus to their community. Here’s the service, also focused on Heaven. I also really enjoyed my time with ACFW, the American Christian fiction writers’ conference. 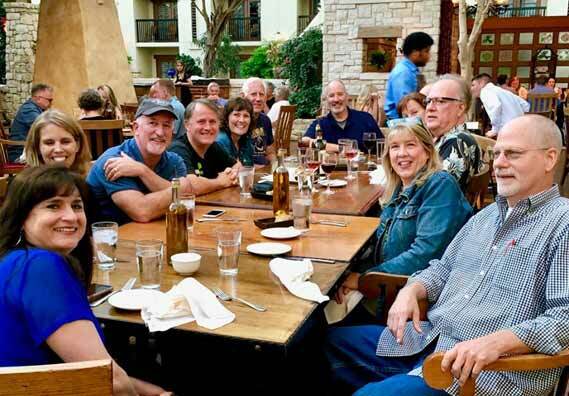 I have many long-time friends who are fiction writers that I rarely get to see, and it was a great joy to be with them and laugh and reminisce and catch up, as well as to meet new writers. It was a great and productive trip, but after nine days it was so good to get back to Nanci and our Golden Retriever Maggie. It was also very fun to get back to watch my grandsons play football!